Looking to raise brand awareness and generate leads in the Indian market, Maruti Suzuki launched the all new Dzire with The Whole New World of Dzire campaign. The objective was to build pre-buzz, announce the launch, drive awareness and to increase the brand consideration with precise placement & communication. The automaker wanted to promote Dzire as a Modern and Indulgent Car for Self and Loved ones. Dzire was developed with the goal of producing a Modern & Permissive car. To create excitement & drive awareness around its key product features — including design, luxury, breadth of capability, technology, and sustainability — The Truecaller platform was therefore the obvious choice for the automaker. Maruti Suzuki wanted to target a specific kind of audience for this campaign that is Individualistic, Image conscious, Health conscious, Tech savvy and Offbeat, and above all, someone who relentlessly pushes themselves to be the best they can. 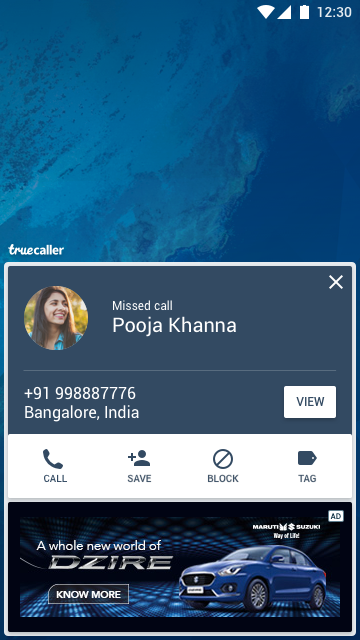 Truecaller & Isobar crafted a Brand Roadblock solution for Maruti Suzuki, that included an After Call Screen high impact roadblock to maximize the reach and reach out to all the users who have interacted with car dealers recently, with a brand message around “The whole new world of Dzire”.